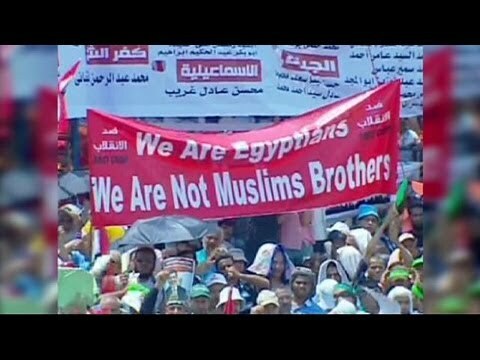 Friday saw large demonstrations in Cairo and several other cities by Muslim Brotherhood members demanding the reinstatement of deposed Egyptian President Muhammad Morsi. Those who are happy to see him gone, including millions of youth of the Rebellion Movement, Coptic Christians, working class people hurt by his economic policies, and Mubarak regime leftovers, have less reason to demonstrate, since they have what the want. Still, some came out to Tahrir Square in Cairo to show support for the transition to a new, elected government. In some provincial cities, there were clashes between the two groups, and a few deaths were reported. At one point, thousands of Muslim Brothers surged toward the barracks of the Republic Guard, where Morsi is rumored to be held, but their path was blocked by the Egyptian military. Meanwhile, U.N. High Commissioner for Human Rights, Navi Pillay, has been pressing the interim Egyptian government for answers as to why Dr. Morsi is being imprisoned and whether he will be charged and tried. One of the most troubling aspects of the movement that overthrew Morsi was that it eventuated in a military coup (not what the youth were demanding) rather than in a recall election. That is, the Rebellion/ Tamarrud Movement just wanted a new election in which Morsi had to defend his right to the presidency, after a year in which he acted arrogantly and high-handedly. The military in turn has arrested a number of Muslim Brother leaders and is holding them without charge and without any early prospect of being charged or tried. All this extra-legal detention is likely intended to put pressure on the Brotherhood to accept what I have called the ‘revocouption’ with grace. But it is also weakening the rule of law in Egypt, which needs to be restored. The huge crowds on Friday were intended to signal that the Brotherhood has no intention of accepting the change in government. There is no reason to think that the Muslim Brotherhood will cease demonstrating any time soon, though to be fair, the interim authorities say they do not have a problem with that if it remains peaceful. If Egypt really goes back to having elections for serious candidates, it seems clear that the Brotherhood can only remain relevant by swallowing their pride and contesting. Egypt can only go forward by allowig that peaceful contestation.